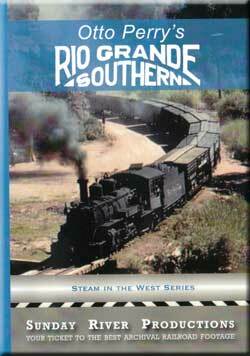 A comprehensive look at Rio Grande Southern. Famed cinematographer Otto Perry is the film source. He filmed the RGS over a ten year period. Both; black & white, plus color footage of the operations. Alva Morrison was a great producer. One of the original masters in his own right. He was an early producer of train videos. Concepts, edits, interviews, scenery, trains, tracks, livestock, history, people, script and more. All sharply done, in this nicely paced feature. A chapter menu divides the show by subjects. Commodities and passengers. Timber, livestock and more. Majority of film is all color. He has many interviews of former RGS employees and family members. The GM of Durango & Silverton , also has some commentary. His Dad worked the RGS.These stories sure add personality. They help us to understand what life was like around the railroad. An engineer speaks of an average, 14 hour workday. This line had 3 of the highest passes to cross in the United States. RGS had 4% grades and a multitude of trestles, cuts, fills and mountain hugging trackage. Challenging! Otto Perry’s films are fascinating! A wide array of viewpoints are effectively deployed. There are trackside and closeups. Spectacle shots of the diminutive trains climbing steep mountain grades. They look like ‘n gauge’ models against the towering backdrops. Wooden buildings are the normal shelters. Looking as if a page out of the old west, they really are! Nice segments of natural sounding trains, working in this remote wilderness. Color film reveals a colorful landscape. Let’s get a sampling of some of this presentation. Timber is the first chapter. 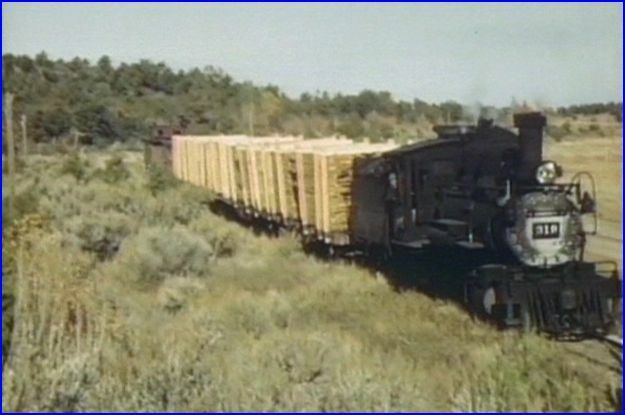 Rio Grande 319 and 461 on one double-headed lumber move. 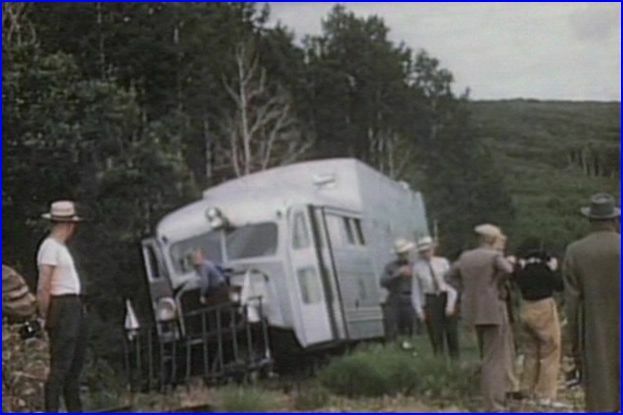 A wreck on Dallas Divide is seen, 8 months later. Short and sweet chapter. Ore has some b&w film. Good clear film. 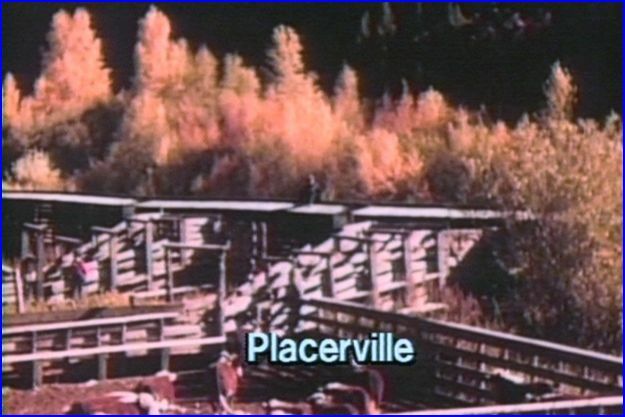 Placerville is one of the locations. 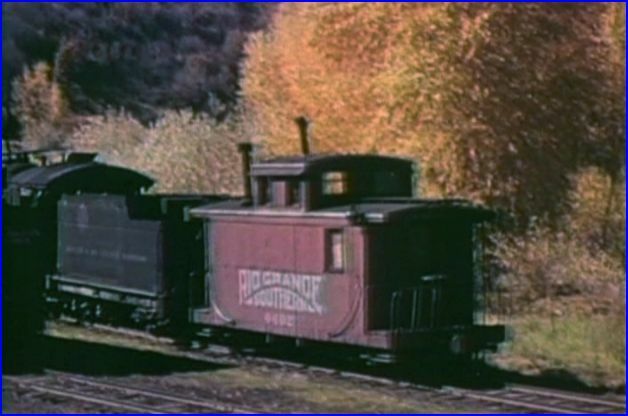 Old timers talk about the challenges of hauling ore trains. Engine #20 is lettered Rio Grande Southern. Color film is an eye opener. Fascinating combination of trains, and mountain scenery. Check the double headers. Memorable! A complete run of a sheep train is featured. At Rico, the livestock are loaded into stock cars. We follow the train for a short time. 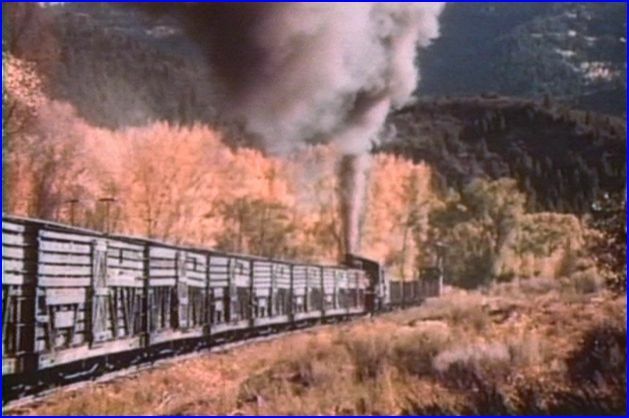 A narrow gauge stock train is a sight! A woman discusses her railroad father, giving hungry hobos some food at his house regularly. The same hobos would be seen by Dad riding a freight, the next day. 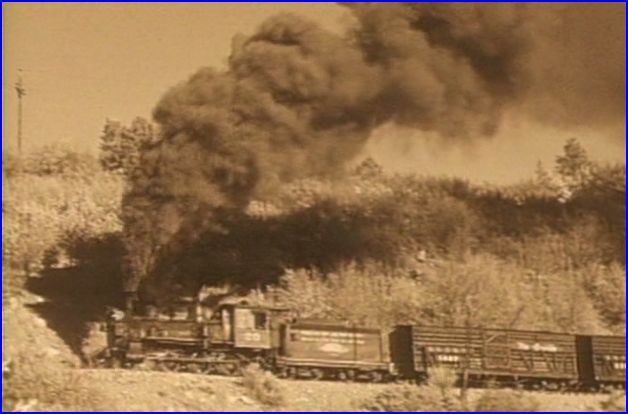 Back with the stock train, it sure is puffing away. The golden Aspens are gorgeous. A cornucopia of views of this train. The sheep are fed and watered at Ouray. Loaded the following day to continue the trip. The empties are hauled back to Rico for another trainload of sheep.A major highlight chapter of the program. Film within the film. Alva conveys much history of the line. Introduction of the Galloping Goose. 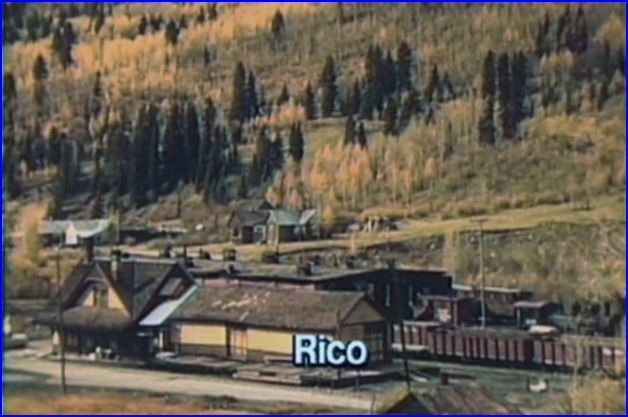 A Ridgway to Durango round trip, for the Rocky Mountain Railway Club in 1946, required 3 Geese to complete the trip. Views from trackside and through the front windshield in color.There is some camera shake, as the goose bounces down the track. That adds character, and a feeling of being in that goose! Old timers reminisce about Goose travels on bumpy trackage. Awesome scenery shots from onboard a Galloping Goose! May 30, 1947 the club tries another trip. This time with steam power, engine #20. 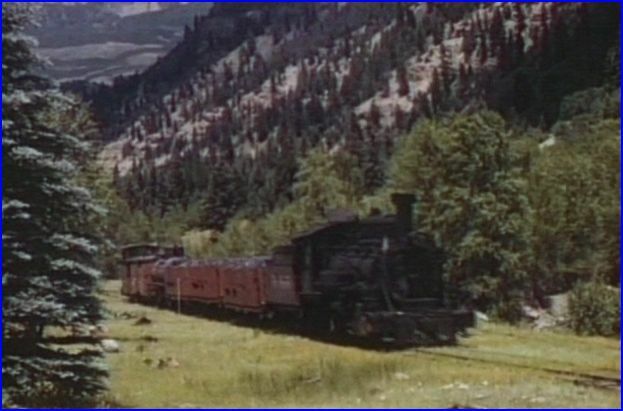 Excellent views of the excursion train. May, 1949 is another outing with #74, a few shots. Sept.1, 1951 was the final trip with #74 and Otto Perry. He captures this one in great detail. Otto hauled his friends in a 1936 Ford and one friend describes a journey to Alamosa. Another discusses the cameras they liked to use. Back to 1951. Stunning scenes that are nearly ‘beyond classic’. 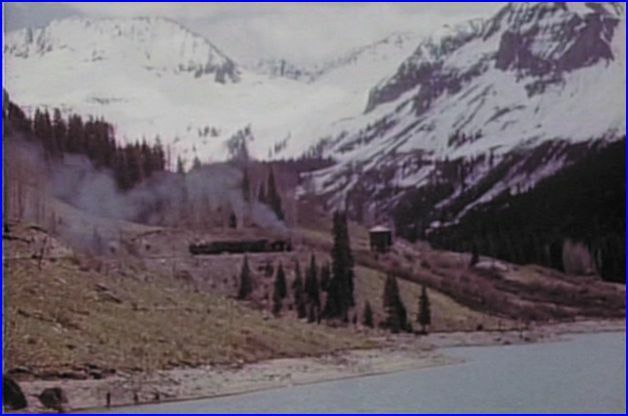 At Telluride, the engine begins the return journey. Trout Lake is a water tank stop. The train backed down Lizard Head Peak for the photographer’s final chance on the line. Even more than I relate here. Outstanding chapter! This Sunday River show contains elements of a PBS style program. 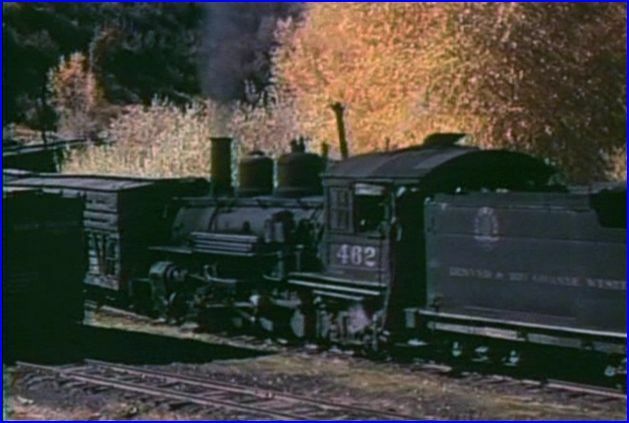 As I have come to expect from Sunday River, a very well produced train video. An instant favorite! Steam train and narrow gauge fans will just adore this one. Otto Perry gives a lesson on cinematography by his choice of viewpoints, lighting and a great eye. 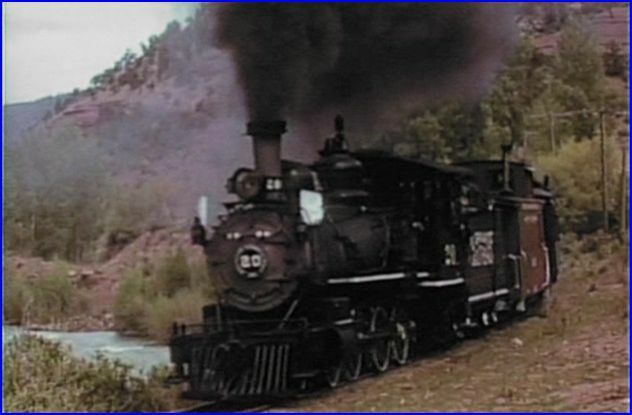 This is one of the best narrow gauge programs on the market. It will be in regular rotation for many owners. 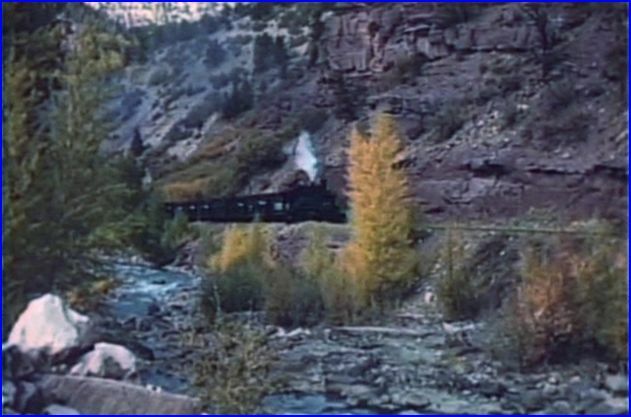 The whole family can enjoy this combination of: narrow gauge steam, beautiful scenery, friendly folks and a bygone view, in some of the old West. 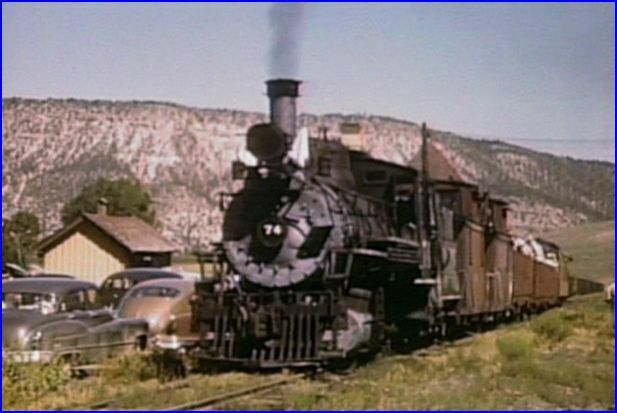 This entry was posted in ATVR Reviews, Steam Train Reviews, Sunday River Productions and tagged American Train Video Reviews, narrow gauge, Otto Perry, PBS style, Railroad, Rio Grande, Steam, steam train, Train DVD, transportation by William J. Hudson. Bookmark the permalink.